Where Is It? And Why Am I Going? Well, the first answer is easy. It’s the capital of the Malaysian State of Kelantan, and it’s at the northeastern tip of the peninsular, close to the Thai border. The “Why” part is a little more complicated. It all started when I decided I needed to start working again. I get bored easily. I live in Thailand with what people call a “Retirement Visa.” That’s not its correct name, but “Non-Immigrant Type O Based on Retirement” is a bit of a mouthful. The rules regarding any type of employment with this type of visa are quite strict. They say something about not engaging in anything requiring effort or expertise. I figure I’m already breaking the rules by making my own breakfast. Now; switching visa types is not as simple as it may sound. I have to leave the country to get the old one cancelled, and visit a Thai Embassy or Consulate somewhere outside Thailand to get a new one. Of course, outside-Thailand is a big place, so I have lots of choices. I could fly to a neighboring capital, or I could drive to a nearby city that has a Consulate. I looked at the costs of flying to, and staying in a large city, and decided it more cost effective to drive. And, timewise, it didn’t make much difference. 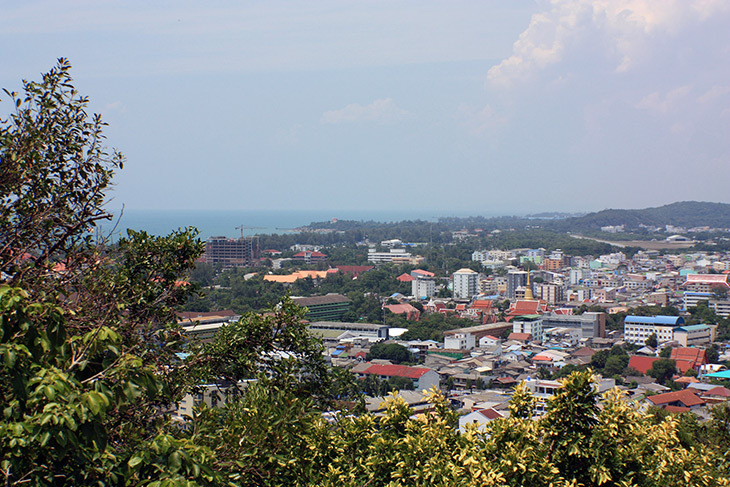 That narrowed the choice to two places – Georgetown in Penang, or Kota Bharu in Kelantan. I chose the latter. They are actually about the same distance by road, and would need similar amounts of driving. But, I’ve been to Penang far too many times, and to Kota Bharu just once. It was a while ago, and I have no recollection of being in the city, just a one night stay in some 0-Star beachside resort – which was one night too many. Plus, the journey to KB would take me through many as-yet-unvisited Thai Provinces. Easy choice then. But, it won’t be a short trip. Living on a small island, I’m dependent on the once-a-day car ferry. Which means by the time I get to the mainland and away from Krabi, it will already be about 10am. And on return I need to be at the jetty by 1:30pm latest. So, neither of those days can be a full day of driving. When I’d decided on all the places I wanted to visit en-route, it started to look like a six day trip. …well, the blue line, although I may take a few detours along the way. 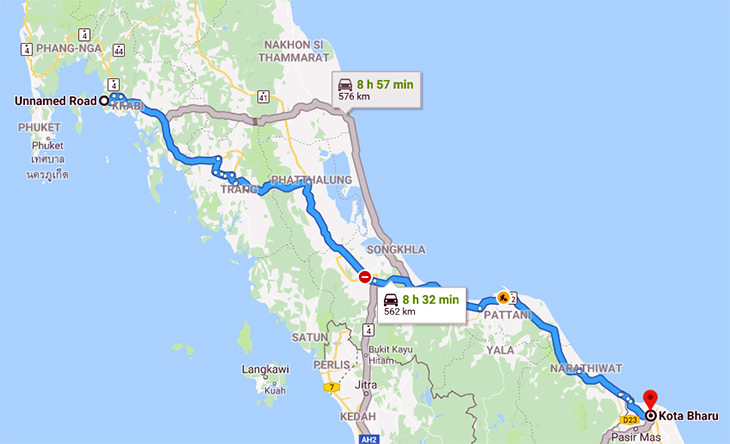 If all goes to plan, overnights will be in Songkhla, Kota Bharu, Pattani and Trang. Anything south of Songkhla will be new territory for me, so I have a list of places and things to see. How many of those I manage to check off depends on things like road works, traffic and weather. Plus, I suppose, unchangeable deadlines, like the ferry leaving at 1400h and the border closing at 1830h. What I miss, I can catch up with real soon. The initial visa will be for ninety days, then I have to go back and get a one year visa. The life of an expat can be such fun! Stay tuned for updates. Although, they probably won’t happen until I get back. Mimi is coming along too, so hopefully there will also be some good videos.